Owning a car in Newfoundland and Labrador isn’t required, but it sure makes life easier. That’s why we launched a car loan service in your province — to make getting financing for your vehicle as transparent and hassle-free as possible, even if you have bad credit or no credit at all. Does LowestRates.ca only work with specific car dealers in Newfoundland and Labrador? Yes. We work with an exclusive network of lenders and dealers who specialize in financing for Newfoundland and Labrador residents who don’t have great credit. Just apply and we’ll match you with a dealer. How much tax do I need to pay on a car purchased in Newfoundland and Labrador? Bad news: on July 1st, 2016, the retail sales tax (RST) on used vehicles in Newfoundland and Labrador was raised from 14% to 15%. That’s one of the highest sales tax rates in Canada. How is the interest rate on my loan calculated? That’s largely determined by the dealership providing you with the loan. Dealers set rates based on a number of different factors: your credit, income, employment history, loan amount, etc. If you can afford larger monthly payments, choose a short loan — you’ll pay your car off faster and also pay less interest. If you need to break the amount you’re borrowing into smaller, more manageable chunks, opt for a longer loan. 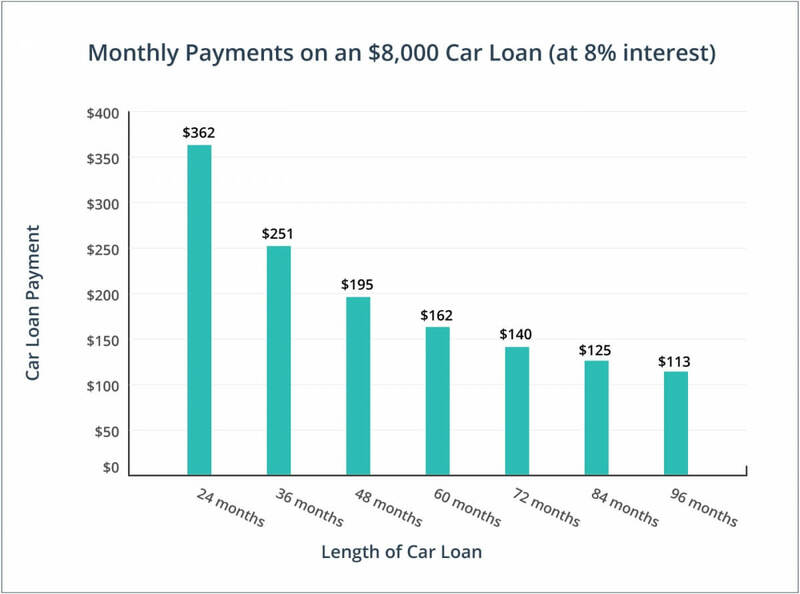 Check out our graph below to see what your monthly payments might look like on an $8,000 car loan at 8% interest. Secure your car loan before you shop for a vehicle. That way you’ll know which cars you can afford and how high your monthly payments will be. You’ll also be able to negotiate strictly on the price of the car, rather than the price and the financing, which can put you at a disadvantage. To calculate the actual cost of your new or used vehicle, consider your loan amount, what interest rate the dealer is offering, and how long your loan term is. Remember: you pay more interest on a longer car loan, and your car depreciates in value as the years go by. Always take a car out on the road before you purchase it. Test the signal lights, heating and cooling, brakes, etc., and listen for rattles or other strange noises. Does the car feel solid and well-built? In Newfoundland, it’s definitely ‘buyer beware’ when it comes to used cars. That's why you need to enlist a mechanic to give your vehicle a thorough inspection before you sign on the dotted line. Interest rates are higher in Newfoundland and Labrador than in other provinces. False. Car loan rates are very competitive in Newfoundland and Labrador, and overall financing costs are on par with other jurisdictions in Canada. If you're unsatisfied with your used vehicle, you have 30 days to return it in Newfoundland and Labrador. False. There are no laws in the province which require sellers to take back a faulty vehicle. In other words, your purchase is final. That’s why it’s so important to thoroughly test drive and inspect any vehicle you’re considering buying. You don’t need to do a vehicle inspection if you buy a car through a dealership. False. Newfoundland and Labrador doesn’t have many of the rules and regulations that govern dealerships in other provinces. It’s especially important to have an independent mechanic inspect your vehicle before you buy. Car dealerships abound in Newfoundland and Labrador. There are 35 dealers in St. John’s, 31 in Burlington, and at least 15 in Gander. Even better: some of these dealers are in our car loan network. Newfoundland and Labrador drivers bought a total of 3,833 new vehicles in April 2016. That’s up from 2,821 new vehicles in March. Road work abounds in St. John’s. The city is currently in the midst of a $270 million infrastructure project, which means lots of construction and plenty of disruption and inconvenience for drivers.